Order your charts now for next sailing season and get the 2019 edition immediately, including all accompanying updates. Do you have the 2018 edition of the DKW charts? Then you can purchase an advantageous upgrade. By upgrading your WinGPS 5 Navigator, Pro or Voyager to the 2019 edition, you are assured of the latest WinGPS 5. Including updates to the waterway network, bridges & locks and current & tidal data. Do you already have a Service Card 2019? Then you can download the 2019 edition of WinGPS 5 for free from your Stentec account. 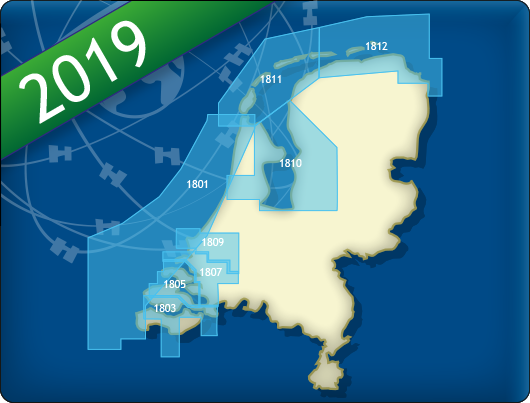 Our first chart release for 2019 is the well-known DKW 1800 series, based on the paper charts from the Dutch Hydrographical Service. Starting now, you can purchase the new chart sets in our webshop or download them for free if you bought the chart set during our pre sale. The DKW 1800 series 2019 are fully updated and will be updated further according to the weekly BaZ updates for the entirety of 2019. Stentec develops innovative on-board navigation software. WinGPS is the most advanced maritime route planner on laptop, board-PC, tablet or smartphone. Combined with waterway charts and your board instruments, WinGPS is a complete navigation system aboard your ship. Stentec offers up-to-date and detailed nautical charts of the Netherlands, Belgium, Germany and the Danube. We also produce charts for Europes' coastal waters, the Caribbean islands and New-Zeeland. We collaborate with a.o. the Dutch Hydrographic Office, Rijkswaterstaat, Imray, Delius Klasing and NV-Verlag. Use your Android tablet or smartphone to show your current position on charts and plot routes. Including the route network for Western Europe and the Danube you are able to easily plot routes on the inland waters. Taking in account the measurements of your ship in combination with measurements of bridges, locks and waterways. Stentec Navigation is specialised in digital navigation for water sporters and commercial shipping. In 2009 Stentec proudly presented the latest version of the Sail Simulator 5 at HISWA: an extremely realistic sailing experience on your computer. Ideal for learning purposes or getting through the offseason. Stable multiplayer server for long distance regattas. Realistic aerodynamics with wind shear and twist. True to nature wave field and sea wearthiness.